I’ve got a lot of junk laying around in my studio/office. And most of it is random/extra parts form past projects. 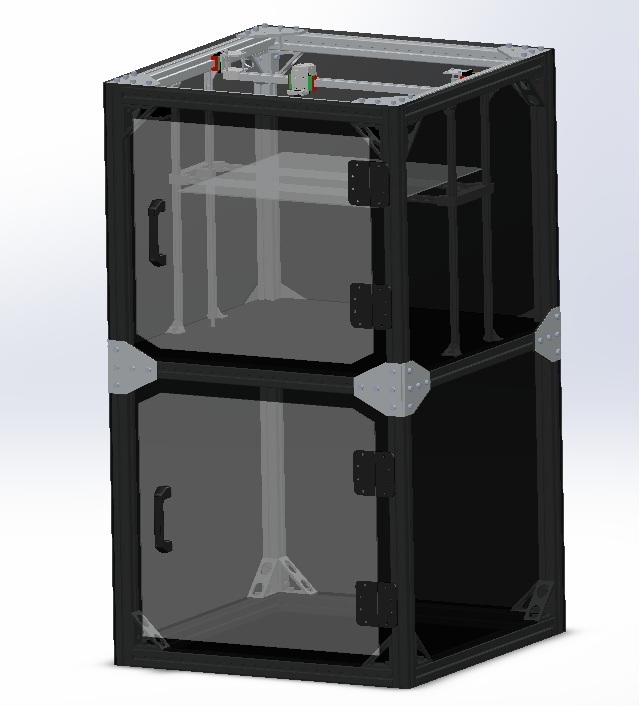 So when I went through it all I was kindly reminded of plans to build a large format (300mm^3 +) 3D printer. With a few days of designing, tweaking, CADing, tweaking, CADing, re-designing, and more CADing, I was able to coming with a pretty nice design. That’s a 500mm x 500mm x 500mm build volume! I am planning on adding another ~150mm in the X direction and ~60mm in the Y direction later on, but for right now I just want to get the thing built. Since I am an avid member of the reprap.org forums, I came across an extruder used by the user cnc_dick. He uses a a MIG welder driver roll in combination with a 100:1 geared stepper to get very high torque and an extremely reliable stepper. I redesigned his extruder to be a bit more user friendly, and I will definitely be putting his claims of swinging the extruder by the filament without any slippage to the test to really see how much this extruder can hold. There will also be a separate post just about the extruder. NEMA 17 motors are great… for smaller sized printers. Since I want to go big, I need to go big on the motors as well. the recommended holding torque for a standard Reprap is 19.4 ozf*in (http://reprap.org/wiki/Stepper_motor#Holding_torque) although it is probably a little dated, so let’s say 40 ozf*in coming from a NEMA 17 with a current rating of 1.2 A. The motors are typically run at a max current of 0.6 A, so you would get approximately 1/2 the rated torque of the motor, 20 ozf*in. Now by using a NEMA 23 that has a torque and current rating of 425 ozf*in and 3A, respectively, I can get a theoretical torque of 85 ozf*in at the same current as the NEMA 17. That’s over 4x the torque! Since this is going to be a pretty large printer, 52″ x 29″ x 29″, I wanted unnoticeable as possible. Instead of leaving the sides open, I decided to put paneling on them to give it much cleaner look. This will also keep the printing environment more controlled by blocking any drafts that might cross the build plate. I also hope to add a full heated build chamber in the future, but like the enlarged build volume, the panel suffice for now. Last, but not least is the storage cabinet. Like I mentioned in the beginning, I have a lot of stuff for my hobbies, so having a large cabinet to store my filament, spare parts, and finishing tools would make my studio a bit more tidy.